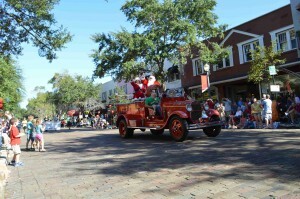 The 2014 Winter Park Christmas Parade will take place on Saturday, December 6, 2014 at 9 am along the streets of Park Avenue in Downtown Winter Park. The parade features over 100 parade units including marching bands, police and fire departments, and Disney World and Sea World floats. After the parade, go ice skating in the West Meadow in Central Park in the outdoor skating rink. Before and during the parade, Leadership Winter Park will host their annual Pancake Breakfast at the Central Park stage from 7:00-10:30 a.m.
Tickets for the breakfast are $6.00 for adults and $4.00 for children. Tickets can be purchased in advance by calling (407) 644-8281. Proceeds benefit Winter Park area elementary schools. The parade is free. Other parades to check out during the Holiday season include the Orlando Christmas Parade in Downtown Orlando that you can find out about here and the Christmas Parade in Baldwin Park that you can find out about here. This entry was posted in Family and tagged activities, annual events, christmas, december, holidays, parades, winter park. Bookmark the permalink.